← Weeknight Beef & Cabbage Stir Up. Add the ground beef to the skillet; cook, breaking apart with a spoon, until browned and crumbly, 4 to 6 minutes. Season with salt and pepper. Once done, transfer to a medium bowl, leaving juices in the skillet. Peel, halve, and thinly slice onion. Return the skillet to the stove over medium heat and add oil. Once oil is melted, add onion, garlic, and ginger. Cook, stirring occasionally, until fragrant, about 2 minutes. Meanwhile, trim off and discard the root end of the cabbage; halve the cabbage lengthwise then thinly slice crosswise. Add the cabbage to the skillet. Cook, stirring frequently, until the cabbage is softened, 2 to 3 minutes. 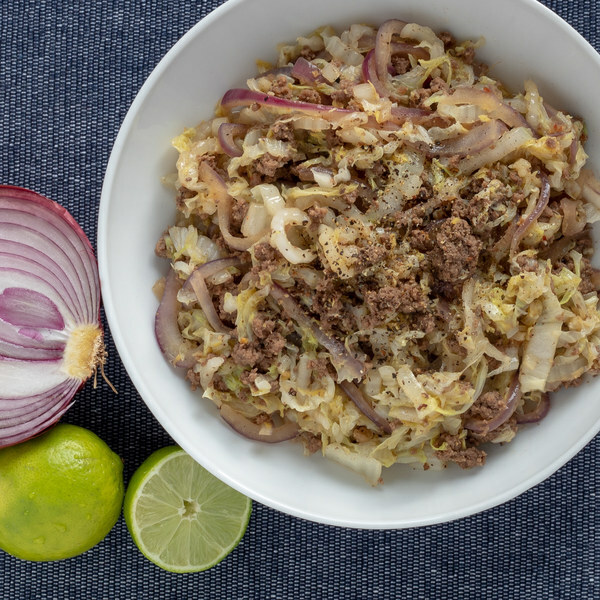 Return the beef to the skillet with the cabbage and season with soy sauce, sesame oil, lime juice, and chili-garlic sauce. To serve, divide the beef mixture between bowls and enjoy!